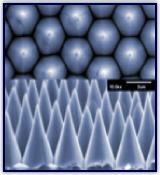 Many unique and useful optical functions can be realized by the fabrication of nanometer scale structures in the surface of a window or optic. 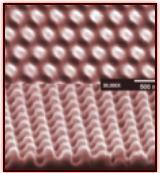 Optical microstructures can be categorized as diffractive or sub-wavelength based on their relative size. 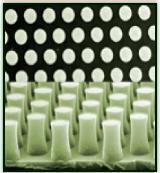 Sub-wavelength microstructures that provide an anti-reflection (AR) function are under development, along with microstructures that can serve as wavelength or polarizing filters. Optical systems that are limited by conventional thin-film coating technology can realize a performance, lifetime, durability, or power handling improvement by integrating a sub-wavelength microstructure.